This fancy tea wooden chest is created by our customer "Boston Tea company" and " Bentley Tea company". 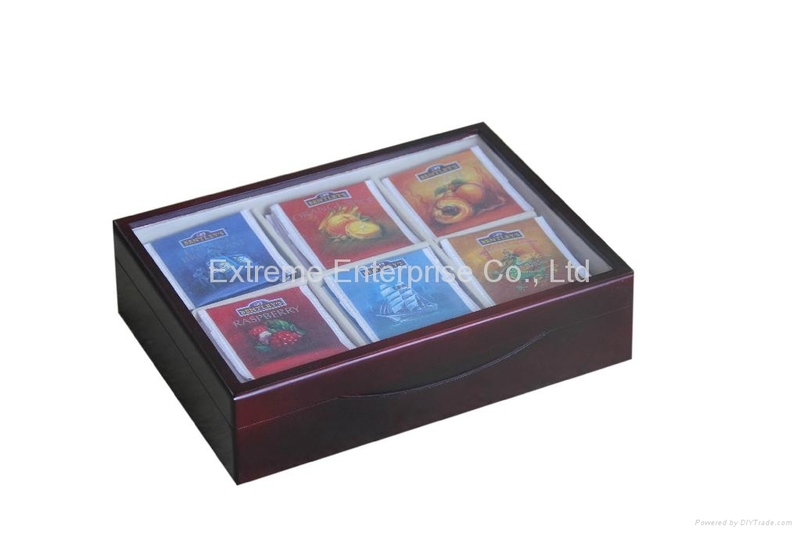 This tea chest has 6 and 8 compartments to hold different quantity and types tea bags. Inside we lined it fully with beige felt including the dividers. This clear acylic glass window can catch your eyes thoroughly due to the nice and colorful tea bags inside. Also the inside size of this tea wooden chests is strictly set up to keep the tea bags steady as people handle it upside down. We take great pride in manufacturing the highest quality, custom made tea wooden chests and tea wooden boxes for each and every customer. We have the skilled workforce and expertise required to meet any and all of your wooden box needs.